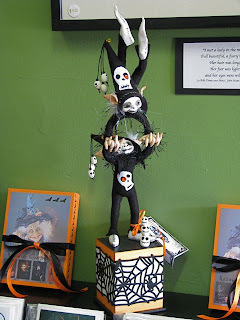 Just some final shots of my Halloween pieces as they are in the studio. 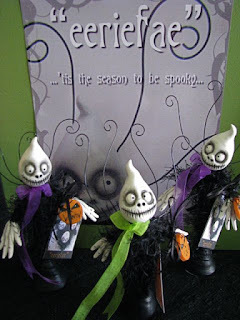 "Trick & Treat" were sold over the weekend and I only have two 'eeriefae' left.....not too bad, seeing as Halloween is a bit of a foreign concept over here. 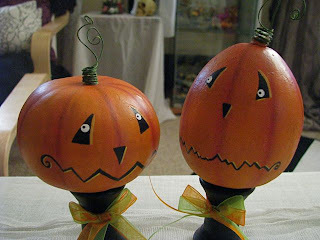 Oh, and the two little pumpkins at the bottom are gourds that I painted last week just for my own amusement. Wonderful Lorell, congratulations on your sales. Your sculpts are brilliant. Everything looks amazing! 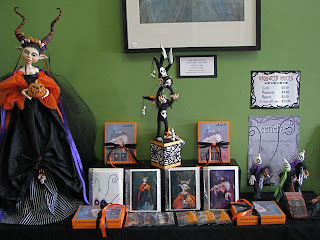 The Halloween Fairy is one of my favorites! Can't tell you how many times I've sat staring at her since you first posted her! She's just amazing!!!!! I just love the way you amuse yourself! They are adorable but your Lady elf with the pumpkin is awesome...you are very talented. I love your Halloween art Lorell! I love my erriefae and that I have a cool poster of "tis the season..."
You are just mind blowing! Nice pix! You are inspirational. I really like these guys. Thank you so much for sharing them with the rest of us. 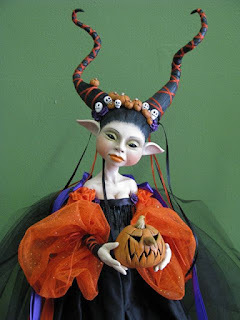 When I first saw your work it blew my mind this is exactly what I look for in fantasy faeish art dolls. I would love to know if you do a wash to bring out detail or do you paint each line and crease with paint like genesis. All though it's past your bewitching hour... Goblins, witches, spider man, and gypsy's grace my door "TRICK OR TREATTTTT" It's so fun for the young ones... and they are always so appreciative for your offering. I turn off my bewitching light and blow out the candles on the pumpkins at 8:30 then it's over for another year.... or is it? 'Trick' & 'Treat'....final Halloween piece!